President Maithripala Sirisena said that he will commit himself to strengthen the national economy and to eliminate poverty in the country with the dawn of the New Year. He made these remarks addressing the media after paying homage to the Temple of the Sacred Tooth Relic in Kandy to receive the blessings for the New Year, yesterday (31). The President further said that the government will commit in the next year to bring essential political reforms and to formulate a new constitution taking into consideration of the suggestions and ideas of the political leaders, scholars and intellectuals as well as the general public. The Presidnet recalled that the government was committed in the last year to secure the democratic rights of people and to build a peaceful society. He further said that the government was able to the confidence of the international community. “The government has planned to provide much relief to the public in the year 2016”, the President added. 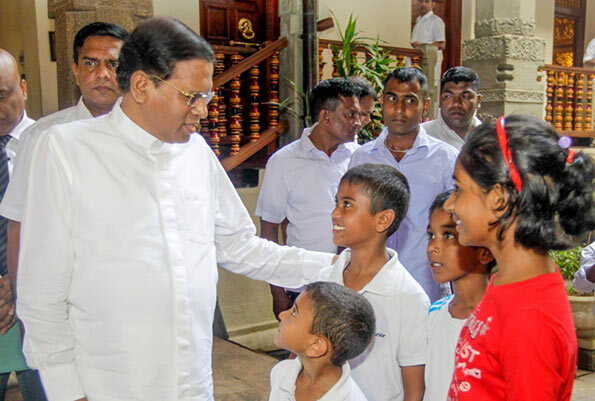 The President took this opportunity to wish all the citizens of Sri Lanka a Prosperous and Happy New Year. Subsequent paying homage to the Temple of the Sacred Tooth Relic he received the blessings of the Mahanayake Theros of the Malwathu and Asgiri Chapters. The First Lady- Jayanthi Sirisena, Minister Lakshman Kiriella, Chief Minister of the Central Province- Sarath Ekanayaka and others participated in the occasion. Talk, Talk Talk. Promises promises promises. Mr. President, before taking about 2016 please tell us what you did in 2015. You had the whole year 2015. What you did? Numerous accusations were leveled at Rajapakse’s. Have you put anyone behind bars?